This article is about the city. For the region, see Winterhold (region). Winterhold is situated on the northeast coast of Skyrim, atop of Hsaarik Head, on the Broken Cape. The land is harsh, and relentless, with constant blizzards. Winterhold, like the other cities of the Old Holds, are known to be isolated, geographically, and by choice. The main road from Winterhold turns around from Mount Anthor, along a mountain ridge that descends into the Sea of Ghosts. 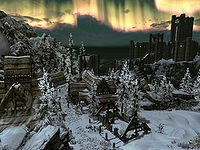 It then enters into an intersection that connects the cities of Dawnstar and Windhelm together. This intersection is also found along Lake Yorgrim. A gateway into the road towards Winterhold is the regional stronghold of Fort Kastav, named after Emperor Kastav. West of Winterhold lies the frozen wastes of the Hold, where various ruins are found, and moving glaciers are located. The Ancient city of Saarthal, and the Dwarven hold of Alftand are found amidst the glaciers. The Ice Fortress of Winterhold, the former home of Arch-Mage Shalidor was found in the region. East of the city, descending into the Sea of Ghosts, is the Bleakcoast Ridge, where various shipwrecks, and Nordic mounds like Snow Viel Sanctum are located across the snow. There are also islands off the coast of Winterhold, such as Olenveld, Serpentstone Isle, and an island containing Ysgramor's Tomb. Winterhold is neighbored by several settlements, including Amol to the south, Dawnstar to the west, and Helarchen Creek to the southwest. Winterhold city's overall layout is unknown. But some claim that Winterhold was quite something in its prime. And being the former capital of Skyrim may further add to this statement. But when the Great Collapse occurred in 4E 122, a large portion of Winterhold was swept away, into the Sea of Ghosts. Now the city is but a shadow of its former self, without any form of defense, like other cities with walls. What remains of Winterhold is several Nordic buildings, made in their traditional style. The Jarl's Longhouse was found along the road that runs through Winterhold. Behind the inn, across from the longhouse lies several ruined buildings, likely from the Great Collapse. Continuing north leads into the College of Winterhold which was left intact after the collapse had occurred. Winterhold's early history is told in legend. One such legend is that the Arch-Mage Shalidor had built Winterhold using nothing but a whispering spell. The last monarch of the First Empire of the Nords, High King Borgas comes from Winterhold. When he died in the Wild Hunt of Valenwood in 1E 369, the tension in the province of Skyrim would grow. The Moot's failure to appoint Jarl Hanse of Winterhold as Borgas' successor was a believed reason that the War of Succession would occur. The conflict would be the prime factor in the Nordic Empire's rapid decline, as their conquered territory became independent as the civil war occurred. The War of Succession would end when Jarl Olaf One-Eye of Whiterun would slay the Dragon, Numinex, and establish himself as the High King. Cities from Winterhold, to Falkreath, would bow down to his might, and acknowledge him as their leader. In 1E 2804, there was a rebellion outbreak in Winterhold, amidst the reign of Emperor Kastav. The Master of the Dragonguard had refused to send help, to quell the rebellion, on the grounds that it violates the Oath of Allegiance. The Akaviri warrior, Kalien would be sent to Winterhold a year later, and subsequently, sack the city. This event would break the trust established between the Dragonguard and the people of Skyrim. But the Winterhold Rebellion would end on a high note, as the Emperor Reman II negotiated a swift end to the rebellion. In 2E 431, High King Logrolf was assassinated, leaving the High Kingship vacant. Naturally, the position would be passed onto his next of kin, his daughter, Freydis. But Jarl Svartr would claim that Freydis was an illegitimate heir to the throne, and that a Moot was needed to choose a proper successor. The Moot would choose Jarl Svartr, even though the Crown of Verity had chosen Freydis. 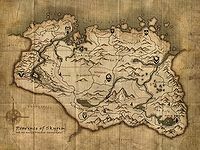 This would cause a schism between West Skyrim and the Old Holds, which formed two different High Kingship, with Svartr ruling the west from Solitude, and Freydis ruling the east from Windhelm. Winterhold was brought into the Eastern Kingdom. When the Ebonheart Pact was formed in 2E 572, Winterhold was brought into the alliance along with the rest of the east. In 3E 290, Uriel Septim VI was named the Emperor of Tamriel, when the Elder Council held more power than the Emperor. Uriel VI would slowly attain more power, and was given a full license until he was twenty-two years old. The power he had would be exercised constantly and vigorously. And by 3E 313, Uriel VI would have more power over the Elder Council. He gained a lot of support from his sister, Morihatha, especially after her marriage with Baron Ulfe Garson of Winterhold, which brought her an abundance of wealth and influence. When Uriel VI passed away, Morihatha Septim was named the Empress of Tamriel, and completed her brother's work, making Cyrodiil a government under the authority of the Emperor. During the Imperial Simulacrum in the late Third Era, the city-state of Winterhold was ruled by King Erarne. It had a rivalry with Dawnstar and Windhelm. After acquiring the first piece of the Staff of Chaos in Hammerfell, the Eternal Champion had eventually made their way into Skyrim, and gained an audience with the Guildmaster of the Mages Guild in Winterhold, Thelen Kaarn. Kaarn told the hero that the piece was located in the Labyrinthian, whose location was long lost. Kaarn had sent the champion to the Fortress of Ice, where a tablet needed to decipher the Labyrinthian's location was stored. After finding the tablet and bringing it back to the guild, the Eternal Champion made their way to the Labyrinthian and found the second piece. In the waning years of the Third Era, in 3E 432, the city-state of Winterhold had experienced a renaissance of power and influence. The first wave of Dunmer refugees would come into Winterhold, providing little burden to the capital city. The Dark Elves brought new ideas, enriching Winterhold's culture, and stimulating the old mercantile spirit of the city. More scholars would come into Winterhold upon learning that the College of Winterhold would contain the Ysmir Collective, the academic center of the college. It held content rescued from conflict in the east. During the Oblivion Crisis in 3E 433, the Old Holds were attacked by the Daedric Horde. The crisis would bring a large distrust towards magic, and the Nords of Winterhold would express hatred towards the Dark Elves that lived in their city, believing they practice evil magic. Even though mages were at the forefront of working against the Mythic Dawn's endeavors. The second wave of Dunmer refugees would come into Winterhold following the Red Year, but some of these Dark Elves would leave later, to return to Morrowind, following the event. Some of House Telvanni would flee to Winterhold following the Accession War in 4E 6. When Solstheim was given to the Dark Elves around 4E 16 by the High King, many people in Winterhold were surprised, though most were expecting the mages to re-locate to Solstheim. But this did not happen, and the Nords were left unhappy. The Nord's hatred towards magic-wielders would extend to the College of Winterhold, and come to a climax in 4E 122, when an event known as the Great Collapse occurs. At this time, Winterhold was ruled by Jarl Valdimar. The Great Collapse refers to when the entirety of Winterhold was swallowed by the Sea of Ghosts and plunged into the depths below. Winterhold's stature as the capital city was lost, leaving nothing but a ramshackle of Nordic buildings, some left untouched, such as the Jarl's Longhouse. It was heavily noted that the College of Winterhold was left intact, leaving many citizens to believe that the College was responsible for the destruction, though Arch-Mage Deneth denies this. To this day, the College would have a negative reputation across Winterhold, and even Skyrim. 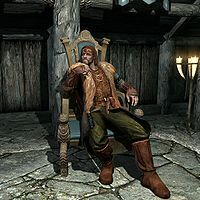 During the Skyrim Civil War in 4E 201, Winterhold was ruled by Jarl Korir, who supported Ulfric Stormcloak, and his endeavor to make the province of Skyrim an independent state from the Third Empire of Cyrodiil, and crown him the High King of Skyrim. Kai Wet-Pommel was the head of the Stormcloaks' armies in Winterhold. The hate towards the College of Winterhold would persist to this day. At this time, the College of Winterhold was spearheaded by Arch-Mage Savos Aren. 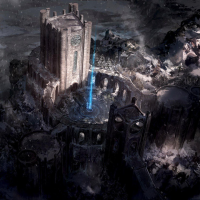 The college would make a momentous discovery while exploring the ruins of Saarthal, where they found the Eye of Magnus. 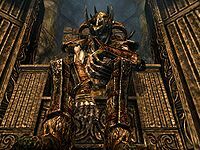 As the college took in the Eye of Magnus, the Thalmor would show interest through their agent, Ancano. The Arch-Mage had sent an apprentice of the College to locate the Staff of Magnus, to tame the dangers that the eye possesses. Their journey took them to the Labyrinthian. Upon returning to Winterhold, Ancano had attempted to harness the power of the Eye. Savos Aren's attempt at interrupting Ancano's effort cost him his life, and magic anomalies had spread across Winterhold town. The college was quick in dealing with the anomalies that terrorized the town. In a final battle, the apprentice had defeated Ancano, and the Eye of Magnus was recovered by the Psijic Order, taken to Artaeum where it remains since. The Nords of Winterhold are known to favor six-foot-long axes. For information on the College of Winterhold, see here. This page was last modified on 16 April 2019, at 15:52.